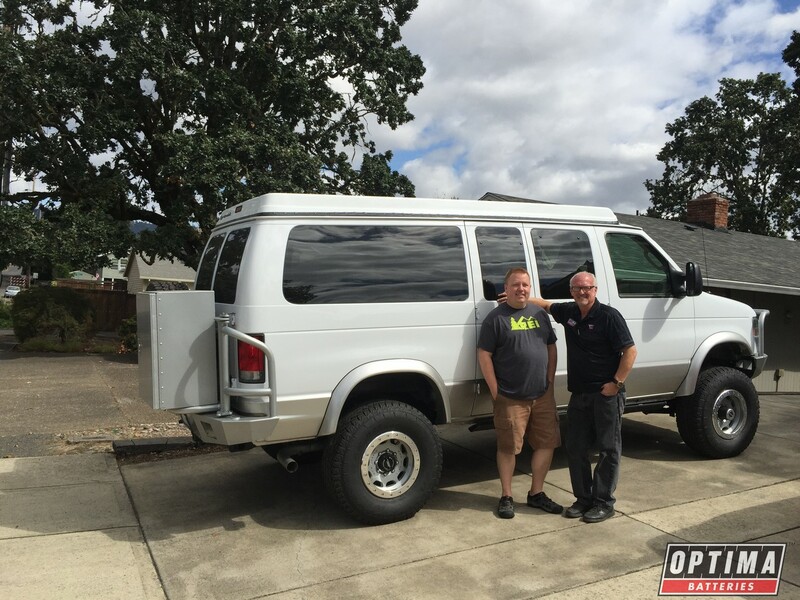 With the crew at Ujoint Offroad wrapping up the four-wheel drive conversion on OPTIMA Batteries' 2015 SEMA Show project van, OPTIMA's Director of Product Development and Marketing, Cam Douglass, took the Econoline on a cross-country trip to the West Coast. The destination was Newberg, Oregon and MG Metalworks, LLC. Owner, Michael Gabriel, is a graduate of Oregon State University's Engineering program and has over 15 years of fabrication experience and a passion for automobiles and machinery. MG Metalworks uses tools that include Solidworks 3D CAD software, 3D printing, CNC-machining technologies and even some old-school fabrication methods and all will likely play some role in the development of the custom interior for the OPTIMA van. While there are a multitude of companies that perform conversion work on vans, Douglass, sought out MG Metalworks specifically, because he wanted to use higher-end materials that are not commonly-used in mass-production conversion shops that often use particle board and other such materials that are not designed to stand the test of time or the rugged conditions in this van's future. Composite materials will be used to cover extensive dynamatting on the floor of the van. It will weigh the same as wood, but will offer more durability and resistance to chemicals and allow for easy clean-up. Stainless-steel will be used for countertop surfaces, with aluminum extrusions for framing out a custom cabinet that will house a refrigerator and microwave oven behind the driver's seat. The van will also feature extensive storage compartments and solid tie-down points for carry larger cargo. MG Metalworks is also planning to integrate several one-off design ideas, including a folding bench seat that transforms into a bed and a folding shelves and fold-out table surfaces attached to the door. Part of the interior work will also include the installation of the stereo system, which includes a Pioneer head unit and speakers, amps and woofers from JL Audio. MG Metalworks will also be adding several more subtle, custom touches to the van, including the adaptation of 2015 power folding and extending Super Duty side mirrors that will have an OE look and operation. As the build wraps up, the van will prepare for another 1,000+ mile journey to Las Vegas that will likely run through Southern California on the way. Once the transformation is complete and the van debuts at the 2015 SEMA Show in Las Vegas, it will go into duty as the OPTIMA Live Event Command Center and Track Day Headquarters. The rig will essentially be converted into a "4x4 Limited" mobile office, paddock and off-grid video capturing headquarters. The van will not be a bug-out vehicle, but it will have the capability of going just about anywhere and staying there in comfort. It will have all the necessary amenities needed while doing serious work capturing and streaming live video from grassroots motorsports events and serving it up to an online audience. The E-350 is not built to be a camper, but rather a nice office with a comfortable place to work, eat and sleep. At the SEMA Show, it will be a focal point of the OPTIMA Booth located in the heart of Central Hall (#22755) and will be used as a meeting room with customers at the show. This van will be the fifth SEMA vehicle built by Cam Douglass, OPTIMA's Director of Product Development Marketing and will promote the best high-end aftermarket enthusiast products, that can easily be installed. All former SEMA vehicles build by Douglass had either booth placement or premium "front door" exposure at SEMA and received extensive magazine coverage, including many feature vehicle articles. The 2016 season promises to be exciting, as the E350 is scheduled to cover approximately 20 of the most high-profile grassroots motorsports event sponsored by OPTIMA Batteries, so there's a good chance you'll see it on the road, at the track or at an event near you in 2016. The only piece missing for this high-profile project is an appropriate name. Tell us on our Instagram, Twitter or Facebook page what you think the name should be and if we choose your suggestion, we'll send you a free OPTIMA battery (lower-48 States only)!